The Hitech 85mm 6 Pocket Filter Wallet is a rugged, foldable wallet for the storage of up to 6 3.3 x 4.3" / 85 x 110mm filters. 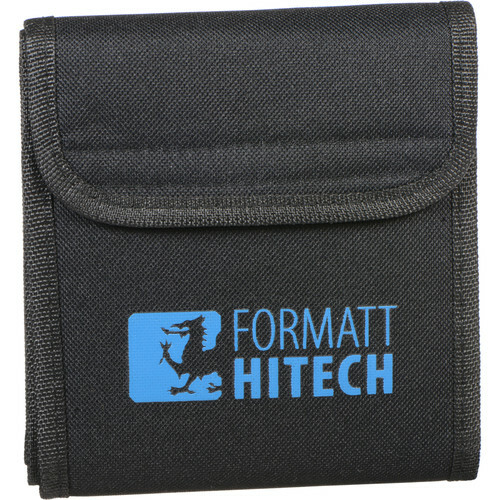 The wallet is constructed from black nylon fabric and features a soft padded lining for protection for the filters. Filters are separated by 6 distinct clear compartments for quick and easy access. There is a hook-and-loop fastener to keep the wallet secure while traveling and during storage. The 85mm wallet will hold both standard square filters as well as 3.3 x 4.3" / 85 x 110mm graduated filters. Rugged, foldable wallet for the storage of up to 6 filters. Constructed from black nylon fabric and features a soft padded lining for protection for the filters. Quick and easy access to the filters via 6 clear, individual compartments. Holds both standard square filters as well as 3.3 x 4.3" / 85 x 110mm graduated filters. Box Dimensions (LxWxH) 8.3 x 5.2 x 1.2"
85mm 6 Pocket Filter Wallet is rated 4.5 out of 5 by 13. Rated 5 out of 5 by Kari from Best solution for 12 P-series Filters... Great Product, give me really fast my right filter to hand. by first using i was not really happy because of the black background so i can't see the difference between the Filters. i began to optimize the wallet. in the 6 spares i set 6 paper rectangles from a thick white paper. on this i see immediately the color, i also wrote the filter description on the papers. as a goodie of this, behind the papers i have now space for six more filters, the description of they i also wrote on the front of the paper. i have all to hand in seconds. Now i have a compact, solid and secure wallet for 12 P-Filters, fits all sizes of the P-serie. Rated 4 out of 5 by Russell from Works as described Filters held securely and well protected. Black background makes it harder to tell exactly which filter is which. It's hard to see whether there is a sharp graduation or soft. The descriptions on my filters are printed in black. I used the paper liners and printed descriptions that came with the filters to help quickly identify individual filters. Filters still fit well even with this extra bulk, but a white background color on the interior would help. Rated 4 out of 5 by Zzzjjj from Does the job The wallet holds filters for p size or smaller units. It can collect sand and scratch your resin filters but this is user error. Take care to clean the wallet and filters. The stitches and Velcro seem solid and well built. Rated 3 out of 5 by The Erstwhile Photographer from Nice, but bulky. I ordered this when I ordered the Hitech Filter sets thinking I would need the protection for the delicate filters. However, the filters came with a protective soft cloth sleeve. This holder is much more substantial than the sleeve that came with the filters, but it is also overly bulky. If I had known the filters came with a protective sleeve I would not had bought this filter holder. It really is not necessary. Rated 5 out of 5 by Matt from Works as designed It is a simple to use filter holder. No complaints. Rated 4 out of 5 by Dibugnara from Hitech 85mm Filter Wallet This wallet provides convenient and speedy access to my ND grad filters. Much better than fumbling with individual filter cases or plastic sleeves. That's important to me when I need to change filters quickly during a sunrise/set shoot. Folds very flat and fits in my photo vest pocket. Rated 4 out of 5 by Thomas from Stating the obvious Not much to say about a folding wallet with slots. It doe exactly what it's designed and supposed to do. There may come a time when more slots would be useful, but till then this one is all I expected. What are the dimensions of the product closed with filters? The thickness of the filters can be different so that is a variable.The width and length is approximately when folded, 175mm x 90mm. Will Cokin P Series filters fit in this pouch? Will this work with regular round 77mm filters as well? I would like to put square filters and round filters in the same wallet. Thanks. When open, are the pockets arranged 6 by 1 or 3 by 2? I bought this item and it didn't come as illustrated. It came by 1. It is supposed to be as illustrated. You may want to call B &amp; H to make sure which one you will be getting.